On our visits to Gooseberry Falls and Split Rock Lighthouse State Parks we found some interesting ice on the beach. 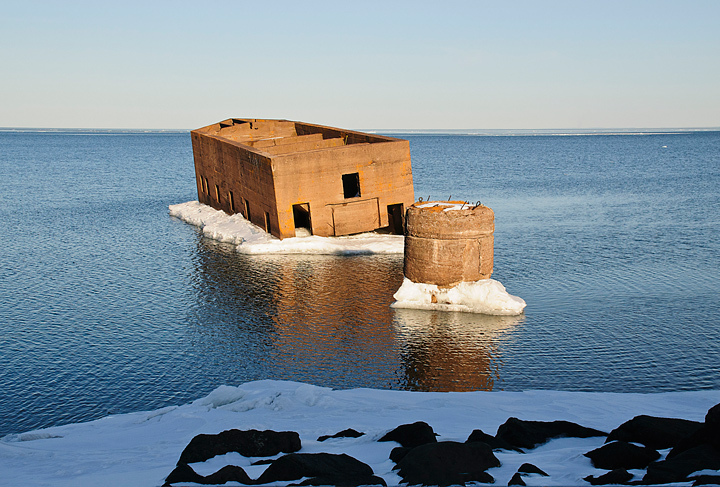 Last week a part of Duluth, Minnesota’s historical waterfront disappeared. Harvey’s Mausoleum a.k.a. the cribs lost the pillar that stood between the shore and the main part of the Mausoleum. It took a while before folks realized that was missing. The Mausoleum was a popular spot for swimming in the summer and in recent years swimmers had attached a slack line between the pillar and the main structure entertaining tourists with their efforts. I assumed the pillar was solid concrete but , in fact, it was a wood frame timber structure sheathed in concrete. The concrete below the water had fallen away and the timbers apparently weakened. The St. Louis County Rescue Squad provided some underwater video of the fallen pillar. This photo was taken after the pillar disappeared. I couldn’t be out on Lake Winnebago without taking some photographs of the ice fractures. We hadn’t stopped at Gooseberry Falls for a while so we decided to walk around and check out the frozen Waterfalls. For the most part they were not all that interesting this winter. After looking at the waterfalls we decided to drive down to the beach and check it out. This turned out to be well worth the visit. There was some great ice in the beach area. We were driving through Montello Wisconsin and noticed these beautiful waterfalls at the Montello Granite Quarry. We were heading out of Duluth, Minnesota toward the North Shore when we pulled into Brighton Beach to check on the ice conditions. There was some nice ice piled up along the shore but what struck me as interesting was the pavilion and swing set waiting for spring against the stark landscape. After breakfast we drove down to the site of the WISSA Races. It was also the Site of the Sturgeon Stampede which was taking place at the same time. It had snowed over night and as we drove along Winnebago Drive the wind was blowing snow off of the lake. The snow was drifting onto the road. When we reached the access to the ice we couldn’t see the race tent on the lake because there was a ground blizzard. We had a little trouble getting onto the ice because of the drifts. The wind was blowing from the north so it was blowing the length of Lake Winnebago before it reached the race site at the south end of the lake. When we reached the WISSA Race site it was almost deserted. On the way out we noticed some fat tire bikes gathering for a race that was to be held as part of the Sturgeon Stampede Activities. We decided to drive back to the Registration Tent where the bike race was going to start from. Unfortunately the snow was blowing so hard that we had trouble finding the tent. We finally were able to see it and notice that the race was just starting. It was difficult to see the racers because of the blowing snow. I jumped out and took a few photos of the racers heading out into the blizzard. Fortunately they were heading off of the lake. We watched the last of the bikers take off then decided to drive out and see what was happening at the opening day of Sturgeon Spearing. We started driving towards Wendt’s on the Lake but noticed another access road going on onto the ice. There was a bridge over the pressure ridge on the road out to the fishing houses. We drove out a little ways but so much snow was blowing that it was impossible to see where the ice fishing houses were located. The road was drifting over so we turned around. There were hundreds of fishing houses out on the lake but we couldn’t find them in the ground blizzard. We drove up to Wendt’s and took their access road out to the fishing shacks. We drove out onto the lake for a ways but we could only see a few fishing houses close to the road. The road was drifting shut so we turned around and headed back to shore. We stopped at Wendt’s to look around and found that one Sturgeon was hanging up in front of the restaurant. No one was at the registration station. There was a fellow selling fish decoys parked at the boat ramp so I stopped to get a photo of his products. Since not much was going one we decided to head back to Fond du Lac. We decided to do a little shopping to kill some time before driving back out to the WISSA Races. Things had improved a bit because they had plowed the road out to the race site. When we arrived I had trouble getting out of the car because my door opened into the wind. The temperature was about 5 degrees with the wind blowing at 35mph. The wind chill was in the minus 20’s. I made my way to the back of the car to get my ice grippers but as I reached the back of the car I found that I was on ice that the wing and blowing snow had polished to a fine finish. The wind started blowing me past the car but I was able to grab a hold of the car and get into the back where my ice grippers were located. I told my wife to watch it when she got out of the car because it was really slippery. Apparently she didn’t hear me. When I got my ice grippers on I walked to the back of the car and found she was being blown down the ice road. I had to retrieve her and get her ice grippers out. Even with the ice grippers it was difficult to walk on the polished ice so we tried to stay on areas that were covered with snow. There were a few kite surfers out so we started walking toward them. It was really brutal out, probably the worst winter weather I’ve experienced. After taking a few photos of the kite surfers we decided this was one of the dumber things we’ve done and started back to the car. Below are photos of to two dimly lit bulbs. On the way I noticed a couple of wind surfers out on the course practicing. I took a few quick shots and we worked our way back to the car. We started driving back to shore when I noticed that some of the bikers were returning from the race that had started earlier in the morning. We stopped for a few photographs. I think the race was supposed to end out at the WISSA Race site but the wind was blowing so hard that once the racers returned to the lake they had to get off their bikes and walk into the wind for about 100 feet before they could turn at a right angle to the wind and bike to the finish line. After watching a few bikers come in we decided to drive back to Wendt’s to see if any more Sturgeon had been brought into the registration station. According to the Wisconsin DNR over 450 Sturgeon were harvested on Lake Winnebago. Over a dozen fish registered were over 100 pounds. Supposedly there were over 13, 000 Sturgeon fisherman out fishing. This fisherman caught one of the larger fish of the day. We talked to another fellow who had been fishing for fifteen years and this was the first year he speared a fish. I said he hadn’t been in his shack more than five minutes when he got the fish. Before we made our trip over to Fond du Lac I called the chamber to find out where to go to see the Sturgeon Fishing. The person who I talked to gave me good directions and indicated that if you hung around Wendt’s you would hear a lot of fish stories. That was sure true. The fishermen were really pumped. After walking around Wendt’s landing for a while we decided to head for home with a memorable experience under our belt. Next time we are going to pick a time when the weather is a little better. More photos from the day can be found on my website.